"Bonjour, madam," the man called out the window of his home, peering down at me in amusement. "Er, bonjour," I replied, frantically searching my brain for the French language skills I had spent the better half of my primary school learning (and failing). "Je suis lost," I finally blurted out helplessly. I had just gotten off a plane ride, train ride, and bus ride: only to find myself lost in the birthplace of the chocolate company Nestle in Vevey, Switzerland. From Hong Kong, you can catch a direct flight to Zurich now on Cathay Pacific (I paid HK$10,700 / US$1,400). The flight leaves around midnight and takes a little over 12 hours, meaning I arrived around 6:15 am local time in Zurich. After you have collected your baggage, you will see signs directing you to the train station underneath the airport. You can buy a train ticket to Vevey at the counter - the IC train is down another level on platform 3, and will take you first to Lausanne (about 2.5 hours), which arrives at platform 5. Then you need to switch trains by hopping on the IR train on platform 3 (I had about 5 mins to get there, which was basically perfect). You'll then arrive at Vevey in under 15 minutes, meaning the total train ride is 2 hours and 45 minutes - and will set you back a whopping CHF/US$ 85. I had been told to catch the urban train 31 to the funicular (basically a fancy name for a tram/grounded cable car that goes uphill) but I wasn't able to find the urban train terminal, so instead I wandered directly across the road to the bus stop, where bus 201 and 212 will take you directly to the Vevey Funiculaire stop. Before I hopped on though, I stopped by the Starbucks directly next door for the most expensive chain cappuccino I have probably ever bought, costing CHF/US$5.50. Things in Switzerland definitely do not come cheap. Pondering how it is possible that a tall (i.e. standard) sized Starbucks coffee set me back US$5.50. When the bus arrives, you will need to flag/wave for it to stop. Purchasing the ticket on board is easy: just select the zone you are travelling in (70 for Vevey) and put CHF 3 into the machine, which will give you a ticket that does not need to be collected or validated by the driver. When the bus approaches "Vevey Funi" (about 5 mins away), remember to press the stop button to notify the driver. At the funicular, the TV screen will tell you how many minutes until the next one leaves (I just missed mine, so I had to wait 17 minutes). There is a ticket machine (CHF/US$5.40), so select Vevey Le Mont Perelin as your destination: it is the final stop at the very top, and takes about 10 mins to get up there. Finally, I was told that the hotel Le Mirador Kempinski was directly opposite the funicular but it's actually down a driveway to the left hand side (which the kind man in the window indicated to me after he gave up on understanding my appalling French language skills), so be prepared to roll or haul your luggage downhill. We stayed in a junior suite with a balcony overlooking Lake Geneva. The rooms are fairly spacious, with a walk in wardrobe that fits two pieces of luggage, a bathroom with a separate bath tub, shower, and toilet facility, and a desk with a pop up vanity table. It is certainly the view of Lake Geneva from the balcony (which comes equipped with two lounge chairs and a coffee table with two normal chairs) that makes this room stand out. Although not particularly high up, the view is very pretty. By the time my family arrived, it was around 2:15 pm so we opted to sit at the Piano Bar for some bar food. The club sandwiches we ordered were cold and not particularly appetizing: although my smoked salmon was fresh, the sandwich was overloaded with mayonnaise (something I hardly ever complain about given my love of condiments! ), and the accompanying chips were not bad - but again cold. We had better luck with the chicken caesar salad: although the salad itself was standard, the chicken (cut in small cylindrical shapes similar to roulade) was tender. Dinner was a very pleasant affair. 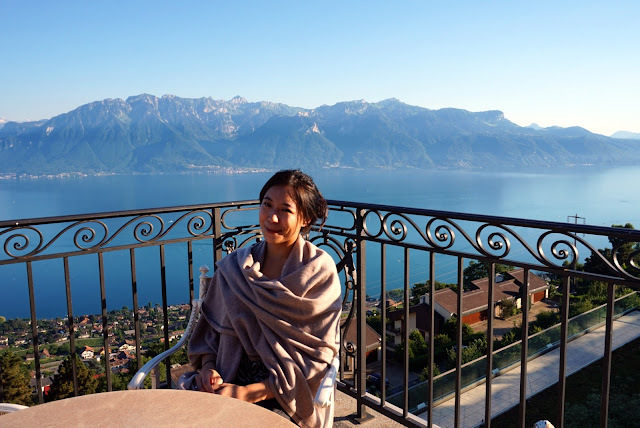 We dined at the Le Patio restaurant (which also serves breakfast, lunch and dinner) and the atmosphere could not be faulted: we ate sitting outside on the terrace in the Summer weather, overlooking Geneva Lake with giant umbrellas shading us and birds chirping. What was particularly stunning was the process of watching the sun set slowly over the course of what felt like hours, given that the sun does not really go down until around 9:15 pm in Summer here. I had the squid ink linguine with clams and crayfish in a lobster bisque (my usual go to dish!) 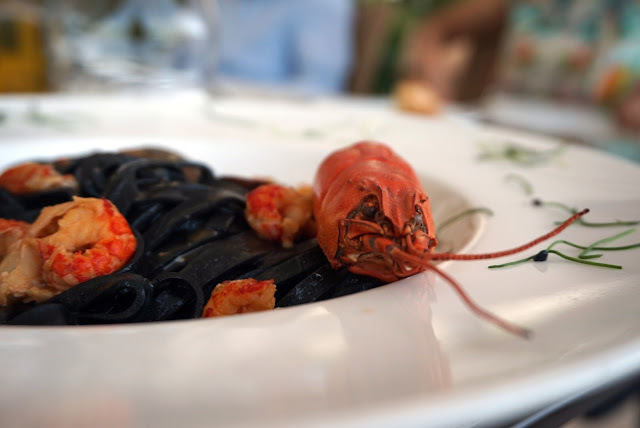 (CHF/US$41), and while the linguine was nothing special, the bisque was light and flavourful (without too much heavy cream), and the seafood, although small, was chewy and rich in flavour. The following night, I opted for the steak tartar (CHF/US$42), and I was incredibly impressed. First, the portion size was huge (220 g). Secondly, the quality of the meat and the flavour it exuded was amazing, having been beaten to a bit of a pulp and mixed with fresh herbs and minced onion. The accompanying toasted bread was slightly soggy on one side, but the tartare more than compensated for it - as did the wedges and the spicy tabasco like sauce (it is definitely spicy, you have been warned!). 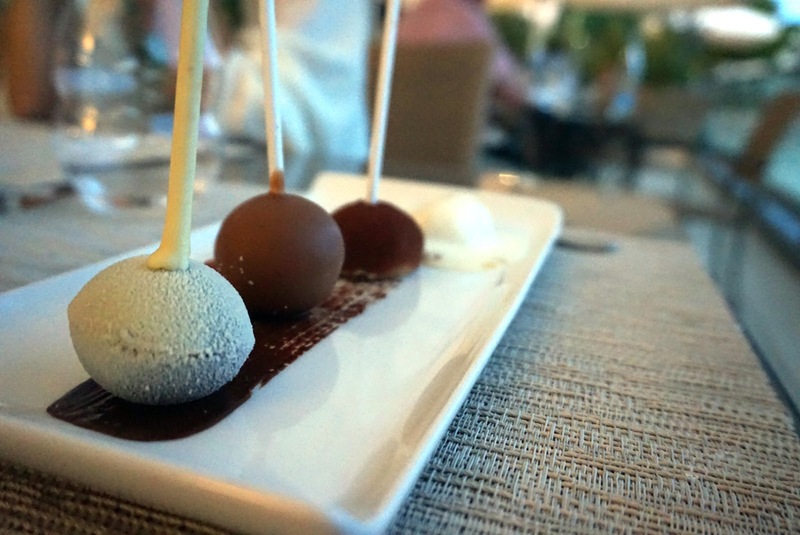 For dessert, I ordered the Le Chocolat (CHF/US$16), a trio of black chocolate lollipops. They were excruciatingly rich: the milk chocolate was excellent, but the other two (one of which appeared to have a flowing caramel sauce inside, and the other one a dark chocolate truffle interior) were too heavy on the palate. I hate to end the dining review on a sour note, but the breakfast here is lackluster, at best. Costing CHF/US$45 (!! ), there are some pastries, a juicer (admittedly, it was pleasant to be able to juice your own combination of fresh fruit), some muesli variations (the chocolate one is delicious - but so unhealthy! ), fruit, chocolates, and an egg station (pick fried eggs over the omelets, which don't have anything inside them). For the boozehounds, there is also a bottle of sparkling white wine you can fill up on. Unfortunately I have been spoilt for choice with my usual hotel breakfasts, so if you also find this selection wanting, then you can opt instead for the Continental breakfast (CHF/US$30) which lets you select juices, pastries, and cereal, as well as tea and coffee. I'm wearing the Milano Cashmere Cape by Feine Cashmere (US$205). The hotel itself is vast, even though it is only six floors high. The facilities here are very good: there is a large indoor swimming pool that lets in a lot of natural light, plenty of deck chairs and sunbeds out on the patios, a very well equipped gym (which also offers various complimentary fitness classes like yoga, pilates and bootcamp like classes), plus sauna and steam room facilities and a relaxation area. Do not catch a taxi from the bottom of the funicular up to the hotel - this costs an insane CHF 50 and is apparently an unpleasant and windy journey on the road up. If you're coming in Summer and want to watch the sun set, be prepared to stick around on the terrace or your balcony until around 9 pm. Service isn't that fast at this hotel, so enjoy a long dinner! Don't eat their breakfast. Pre-pack some oats or pastries and eat them instead, or go down in the funicular to eat breakfast at the town - you'll be saving yourself CHF 45 worth of disappointment! Plus, there's a Nespresso machine in the room, so you can always make yourself a coffee. Such a wonderful experience Carmen! Thanks for sharing it! I really felt traveling with you by reading the article and seeing your pics! Keep enjoying the rest of the journey!